Lake Bonavista residents are actively engaged in their community and keeping them informed is our top-priority. 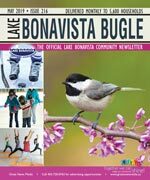 Lake Bonavista Bugle is the official community newsletter, and covers community news and is published monthly to keep content current and relevant. Delivered to every household, apartment, and business, every resident is acquainted with the community’s most important information. In the City of Calgary’s 2012 municipal census, Lake Bonavista had a population of 10,475 living in 4,106 dwellings, a -1.3% increase from its 2011 population of 10,610. With a land area of 5.2 km2 (2.0 sq mi), it had a population density of 2,014/km2 (5,220/sq mi) in 2012. Residents in this community had a median household income of $101,025 in 2005, and there were 4.4% low income residents living in the neighborhood. For more detailed info visit the City of Calgary community profiles site. The Lake Bonavista Community Association (LBCA) is represented by a volunteer Board of Directors elected annually by it's membership. The Non-Profit Association operates a 65,000 square foot recreation complex offering social programs, sports programs, and physical fitness programs to its membership. The programs offered, physical facilities available and the business of LBCA is extensive and the success of these activities is greatly dependant on the efforts of a very large number of volunteers together with the capable office and building maintenance staff.